During WWDC 2018, Apple devoted a bit of screentime to tvOS 12, but not nearly as much as the others. 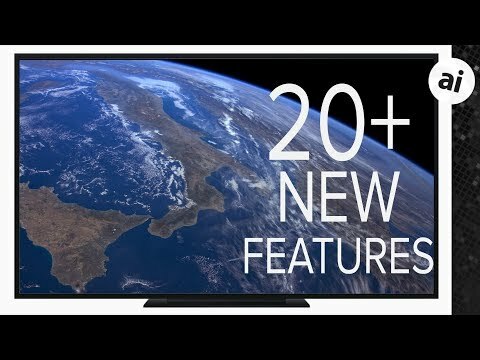 AppleInsider dives in and find over 20 new features and changes coming on Monday to the Apple TV. What is clearly the biggest feature coming to Apple TV, is Dolby Atmos support. That will make the Apple TV the only set top box to support both Dolby Vision and Dolby Atmos. Additionally, like 4K content, Apple will be upgrading eligible content to support Dolby Atmos for free. We are also getting a successor to single sign-on, zero sign-on. Apple TV will automatically take your location, and your local network and authenticate you against your cable subscriber, giving you access to any number of third-party apps. One of our personal favorite new features, is password AutoFill. Whenever a user goes to sign into an app, the QuickType keyboard will automatically appear on their iPhone or iPad. But thanks to tvOS 12 and iOS 12, it will now include access to saved passwords. This makes it measurably easier to sign-in to apps and services on the device. What's more, there is now support for guests. When going to sign-in, if an unknown iOS device is within a foot or so from the Siri remote, it will automatically get presented with a pairing code prompt before they are able to then use their own stored passwords to sign-in. It works delightfully well. In Settings > Apps > TV, "Up Next Alerts" changed to "Games in Up Next"
In Settings > Apps > TV, "Featured Sports and Events" changed to "Exciting Games"
In Settings > Apps > TV, "Product Announcements" changed to "New Features"
tvOS 12 is set to launch this fall alongside iOS 12, watchOS 5, and macOS Mojave. Be sure to check out our other cumulative videos with all the new features coming to iOS 12, watchOS 5, and macOS Mojave! I love the remote. Its very simple and basic, yet performs 99% of what you need it to do. The only thing I can think of that it is missing is a dedicated power button, which it doesn't need if you set up HDMI through ARC. The only real issue that I've had with the remote is orientation of the device in the dark. The newer versions have a raised Menu button in the upper left below the touch-sensitive pad. What had you heard? In addition to the orientation issue, I also find the remote difficult to hold onto (it slips out of my hand) and the glass surface can shatter if dropped onto a hard surface, such a ceramic tile floor. Its relatively small size and thinness encourages its disappearance into crevices. The Siri remote looks svelte, but it's a frustrating example of form over function. A third-party case made the Siri remote livable, though not preferable, for me. I bought my first of four Apple TV 4's two years ago and I still don't like the remotes. Meanwhile, my TiVo's "peanut" remote is ergonomic, functional, practical, and durable, though not the most attractive device to have sitting around. I Agree, the remote is somewhat awkward to handle, but I can't tell it's big enough issue to be a show stopper. I rarely use it since you can use the iOS dedicated remote apps and/or traine any IR remote or automatically thru the HDMI-CEC (ARC) protocol. Besides being way more sensitive to touch than it needs to be there really is no reason for you wait to jump in. They have also added a raised ring to the menu button that makes it much easier to tell where the menu button is and which way the remote is actually pointing. If you own a 2nd or 3rd gen ATV this is a MUST upgrade in my opinion. There are 4 versions of the ATV 4th Gen.... 32gb or 64gb non 4K or 32gb or 64gb 4K. I think saying that the siri remote has been neglected for so many iterations is a bit of a stretch. zroger73 said: The Siri remote looks svelte, but it's a frustrating example of form over function. What form would you expect it to have with 5 total buttons and a touchpad? To me, it's always been a significant improvement over the previous two ATV remotes which had buttons which mimicked the look of the iPod touch wheel for no functional reason. Just hold the home button to put it to sleep. It only needs to power down to update the system. And you can set that up to do it automatically. I have zero problems with the remote. People just need to use it a few times and it will become second nature. That first sentence, tho. Damn. The Siri button being “caved in” is how I use it to determine the orientation. It does exactly the same thing, feel for the Siri button and you automatically know it’s supposed to be on the left side of the device. So the only real major “miss” I can think of with the remote is.... Mute. Where is the mute button? Now I know that you could just simply hit pause… But seems to be one of the most basic functions of a remote. This usually just happens when I’m watching TV, maybe watching a live sports program… And the wife needs to take a phone call. I’m just really surprised that there isn’t that function built into the remote. I like the simplicity of the remote but it’s generally difficult to handle… And just seems rather lacking compared to various competitors. Is that an Apple/ATV issue or Google who handles the Youtube app? My 4K ATV is in Dolby Vision all the time until I play something that isn't. I feel like it was there right away when I updated to IOS 11 on my iPhone, but I had to add it on my iPad control center.. I haven’t had a need for a power button. Goes to sleep in 30 minutes, or Click and hold the home button to initiate sleep, which then shuts off my TV. The remote is OK, love the touch swiping, but just not crazy about the symmetrical flat shape. I had to get a rubberized remote sleeve to make it more ergonomic and prevent slipping and sliding everywhere all the time. Is there any evidence of Comcast cooperation with the zero sign-on feature? So far they’re not playing ball with single sign-on, and refuse to authenticate a whole swath of content apps. Not surprisingly, however, I can watch my local affiliate live through the NBC app. My annoyance with the remote/UI is the lack of clarity around what the menu button will actually do. Sometimes it goes back by one level within the app, other times it will show the little top menu, and other times it'll exit the app and take you to the home screen. You can't hold it down to go to the top level within an app, you have to click-wait... click-wait... click-wait... until you're at the level you want. They've overloaded the menu button with too many actions. A few extra buttons on the remote wouldn't go amiss. I'd much rather reassign the useless Siri button to something else, such as home. I know you can reassign the TV button, but it's fairly useful to take you directly to the TV app. I ask Siri to play something, and instead of presenting me with the free options first, it tries to route me to the iTunes Store. I have to hunt around for the free option. Why would I ever buy the show when it's on BBC iPlayer for free? Similarly, I've never had it work with Plex, so I just don't bother. It's unfortunate that Siri is really becoming a quite a joke. When on voice calls with my friends they sometimes shout out "Hey Siri" and try to get my HomePod it to play things. It's almost always wrong or "I can't do that on HomePod".